April is almost coming to an end, and we have only a week left to complete our month-long marathon!! Today we are visiting the state of lively, thumping Balle Balle, Punjab! Punjab to me is how bollywood has shown it!! Fields of Mustard (Sarson ka kheth), every occasion celebrated like a festival, with lots of decoration around, ladies sitting together playing dholak, singing foot thumping punjabi songs!! If this is not the scene in the real, please do not blame me!! Blame Dilwale dulhania le jayenge, Jab we met, pyar tho hona hi tha, and many more bollywood movies in this list!!!! Coming to today's recipe, i choose a very simple, but healthy and a delicious snack from this Land of the Golden Temple!! 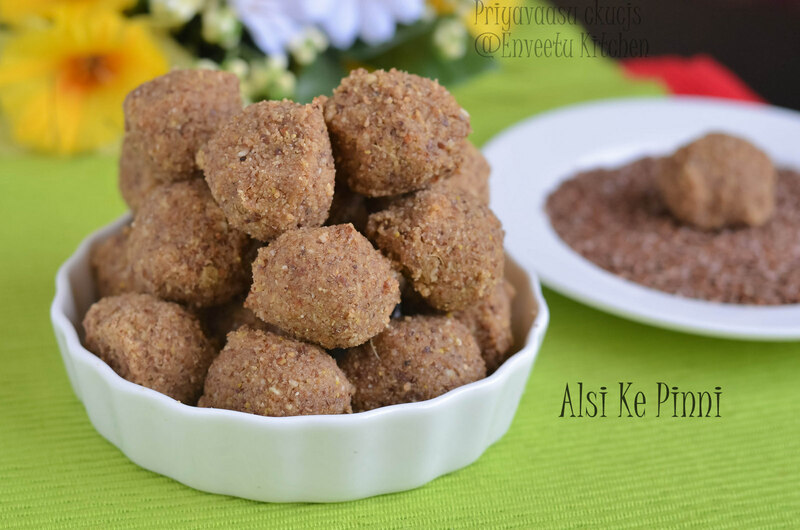 Alsi ke pinni/Flaxseed laddu's a delicious winter snack made to protect our body from cold/cough and other winter ailments. you must be thinking that i should be mad to make this now in summer, but serioulsy, the ingredients are so temptingly healthy, that i didn't bother the season. Heat 3 tbsp of ghee in a kadai. Add Whole Wheat flour to this and roast in a medium flame, until it gives out a nice aroma. Take care not to burn the flour. Transfer to a flat plate. Next add another 2 tbsp of ghee, add the edible gum/gond and fry it in a medium flame, until it flowers up nicely. Take care while roasting, the flame must be medium to ensure proper frying or else you will end up with gum that is still raw in the center. Transfer to a flat plate. Crush it well using a roller-pin to powder. Set aside until use. Nest add 2 tbsp of ghee, add flaxmeal to this and saute for a minute. remove on a flat plate and set aside until use. 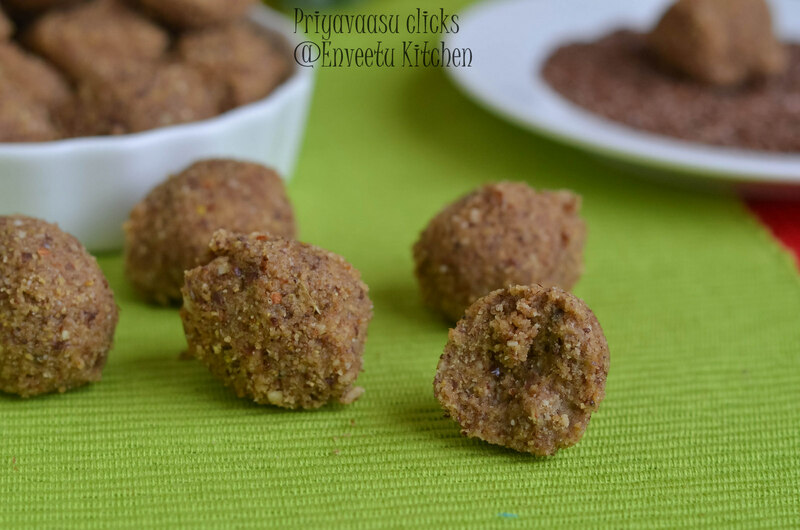 In the same add the nuts and roast them with a tsp of ghee. 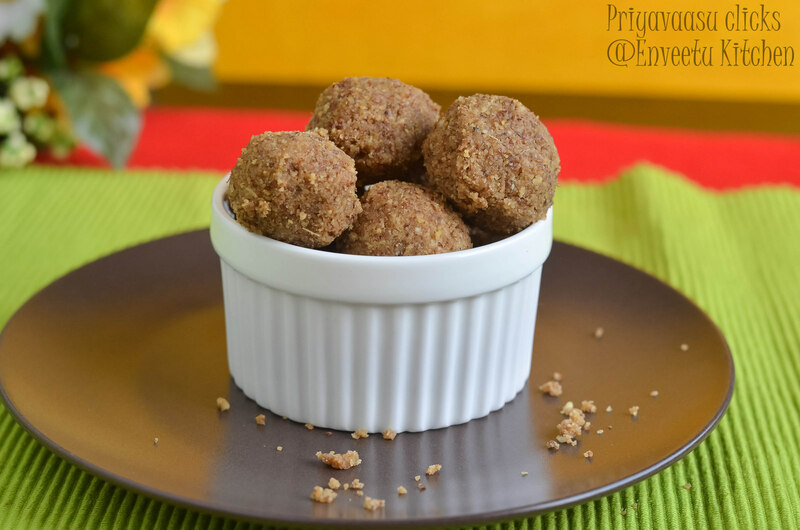 After roasting all the ingredients, add powdered jaggery to the pan, add 1/4 cup of water, let it dissolve, boil until it reaches 1-string consistency. How to check this: When the jaggery syrup bubbles up and froths nicely, check a drop of syrup with a laddle, stretch it between your thumb and index finger, it should easily form a single-string. Once this stages reaches, act fast, Remove the pan from fire, add all the roasted ingredients to this and mix well. Let it cool a little, Start making golf-sized balls out of the mixture, by pressing it tightly in your palms. If needed, decorate each ball with a roasted cashew on top. Remember to switch off the flame, once the jaggery syrup reaches single-string consistency or else the syrup will reach hardball consistency fast and the mixture will turn hard. In case the mixture turns hard, do not worry, run it in the mixer once, it will return to powder form. Add litte ghee and make the pinni/balls. You can even make squares out of the mixture, just keep it on the stove for 2 more minutes, the mixture will start coming together, immediately pour it on to a greased flat-plate and smooth-en the top and make markings for squares using a serrated knife, once it cools, cut into squares. 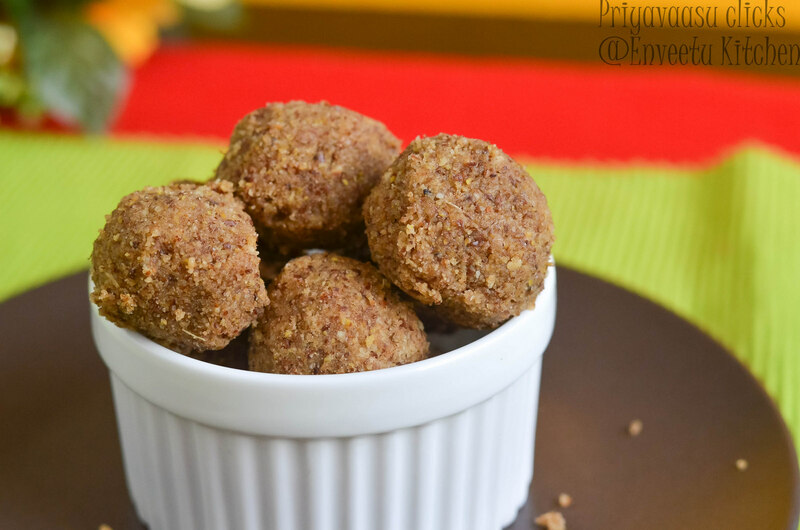 Wat a fantastic laddoos, thanks for sharing..Cant wait to make this healthy laddoos. Loved this recipe. I have bookmarked it. sarson ka kheth - so beautiful pictures!!! 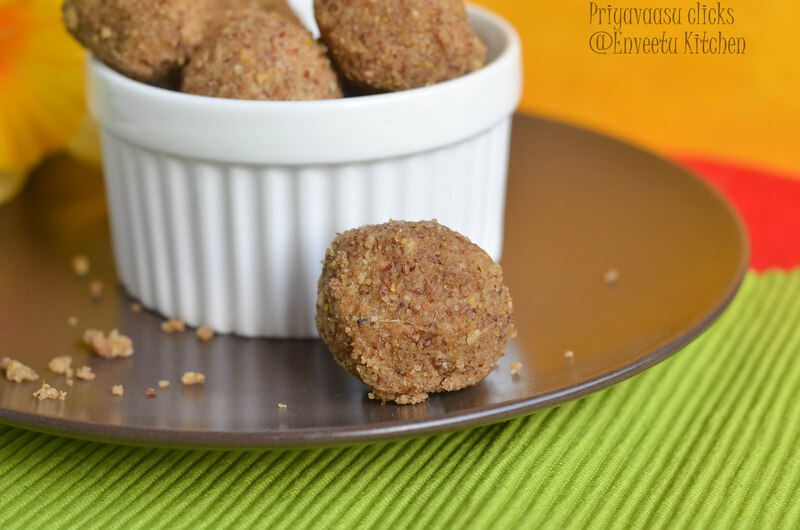 and this laddu is super healthy and so kid friendly!! Those do look healthy and delicious. Lovely clicks, specially the first pic where you had a touch of different colors. These laddus sound quite healthy. Nice healthy recipe. 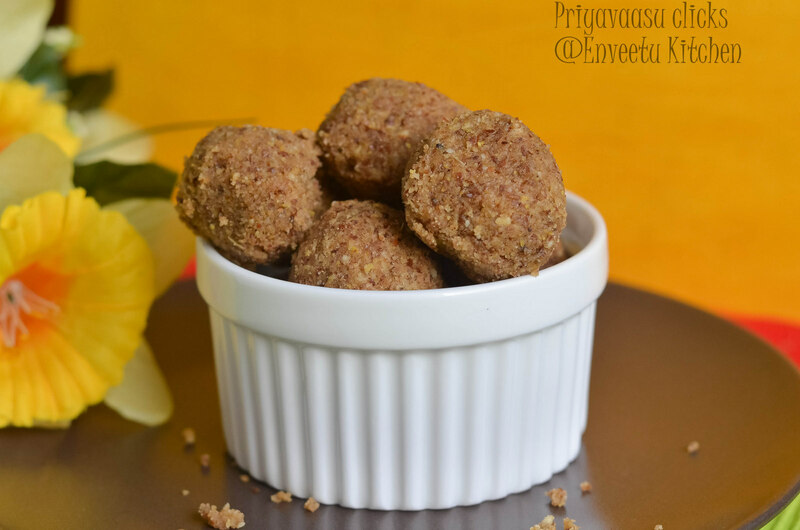 Healthy and cute looking ladoos...feel like grabbing it.